YPSA Consortium organized different programs on occasion of World AIDS DAY at Theater Institute of Chittagong on 2 December with the support of Ministry of Health & Family Welfare of Bangladesh Government and Save the Children USA. 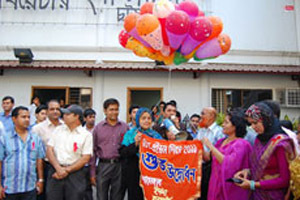 Jobida Nargish Khan, Panel Mayor of Chittagong City Corporation inaugurated the ceremony.Mr. Sayed Morshed Hossain, Co-President of Ma O Shishu Hospital, Md. Giash Uddin, Councilor of Cittagong City Corporation, Mr. M. Nasirul Hoq, Editor of Suprobhat Bangladesh, Mr. M A Chowdhury Salim, Director of BGMEA were present in the program. Garments workers, peer educators, Master trainers and NGO activist attended the quiz and cultural program. 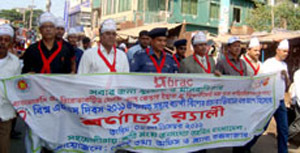 YPSA and Coordination Committee jointly organized a procession in front of the shahid Minar Chittagong and Discussion session at Civil Surgeon office Auditorium on the occasion of World AIDS Day 2011.Dr. Abu Taybe, Civil Surgeon of Chittagong inaugurated the program. 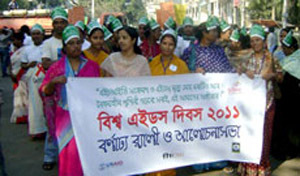 Over 500 governmental, NGO, civil society, and target population individuals attended the rally. Dr. Abu Taher Director of Health Chittagong was the chief Guest and Dr. Md.Abul Quashem,consultant, Additional District Magistrate Mr. M A H Humayun Kabir was the special guest in the program. Sitakund Upazila Health & Family Welfare and YPSA’s Adolescent Reproductive Health Project jointly arranged rally and discussion meeting at Sitakund. Mr. Abdullah Al Baker Bhuyan was present as the chief guest and Mr. Alamgir Hossain, Upazila Nirbahi Officer of Sitakund was present as special guest in the program. 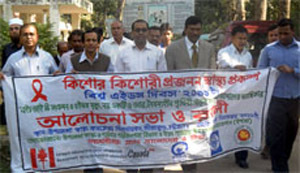 District Information Office organized a Rally & discussion meeting at the local public library field, Cox’s bazar on the occasion of World AIDS Day 2011. Mr. Nurul Alam Nijami, ADC (General) of Cox’s bazar presided the program. Mr. Md. Joynul Bari, DC Cox’s bazar was the chief Guest and Mr. Selim Md. Zahangir, SP; Mr. Dr. Md. Abdus Salam, MOCS, Cox’s bazaar and Mr. Prithom Kumer Chy. DD. Social Welfare, Cox’s bazar were the special guest at the program. Rangamati District Administration and Health Department jointly arranged rally and meeting where YPSA and different organizations, journalists and civil society representatives from Rangamati attended the program.